Editor’s Note: Here, we continue to publish the work of Dr. Laurie Britt-Smith and her exploration of Bono’s rock-n-roll rhetoric. In this installment, she provides the background needed to understand the concept of a Discourse community as explained by James Paul Gee. We hope that folks who have been following this series of posts will study this one carefully as it will set up the next series of articles. Walter Brueggemann emphasizes the relationship between the individual and the community which provides an additional link to what I consider to be the heart of my study: analyzing the power and effectiveness of Bonoâ€™s rhetoric by examining his literacy acquisition. 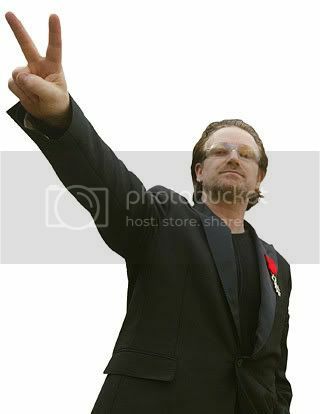 Bono has acquired multiple social languages which allow him to cross Discourse boundaries of multiple communitiesâ€”many of which are usually at odds with each other. It is not enough to analyze just the rhetoric; I want to examine where it comes from and why it is effective beyond the cultural model (or Discourse community) from which it sprung. The work of James Paul Gee provides the foundation for that additional step of analysis. In order to understand Gee, one must go beyond the boundary of the traditional definition of literacy; the ability to read and write texts. In addition to examining the acquisition of that specific language skill, a socio-cultural view of literacy also focuses on the cultural resources and models that mediate the individualâ€™s participation in social practice. Literacy learning is a socially mediated process, and in order to understand anotherâ€™s literacy, one must examine the context of circumstances and events surrounding the development of that individualâ€™s acquisition of social literacy, the forms of mediation available, and the nature of participation across cultural practices. Gee identifies literacy as Discourse. No specific or singular language or language skill makes one literate, but rather literacy is the ability to maneuver the multiple social languages within a Discourse. Oneâ€™s primary Discourse, according to Gee in What is Literacy, comes from oneâ€™s â€œoriginal and home-based sense of identity.â€ It is acquired not by overt instruction, but by casual social interaction with members of a primary socializing group, be it family members, peers, or any person one is intimately associated with. In order to explain the role of Discourses when analyzing a culture, Gee uses the image of a map. Each Discourse is like a country on the map, but the boundaries are flexible. You place the map on top of any language, action, or interaction you want to think about. The boundaries of the Discourse areas on the map slide around in negotiation or interaction with others. As Gee explains, often the discourses are incomplete or are in conflict with each other as one learns or acquires several Discourses. Failure to negotiate the conflicts inherent between discourses is one reason why few rhetoricians are able to organize the communities that exist with any given Discourse community, let alone cross boundaries of distinctly antagonistic cultural groups. This is one of the reasons why Bono’s rhetoric is worthy of study. He is able to cross boundaries with a measurable degree of success. It is equally interesting to look at when he has failed to do so to try and figure out why. nevermind great article, didn’t know it was a series of articles on rethoric concepts..
HAS ANY 1 SEEN THE U2 ACHTUNG BABY HELMET ON EBAY ITS AMAZIN ONLY 150 MADE IVE BEEN LOOKING FOR 1 FOR AGES!! !